[187 Pages Report] The artificial intelligence in transportation market is valued at USD 1.00 Billion in 2016 and is projected to grow at a CAGR of 17.87% during the forecast period. The base year considered for the study is 2016 and the forecast period is from 2017 to 2030. 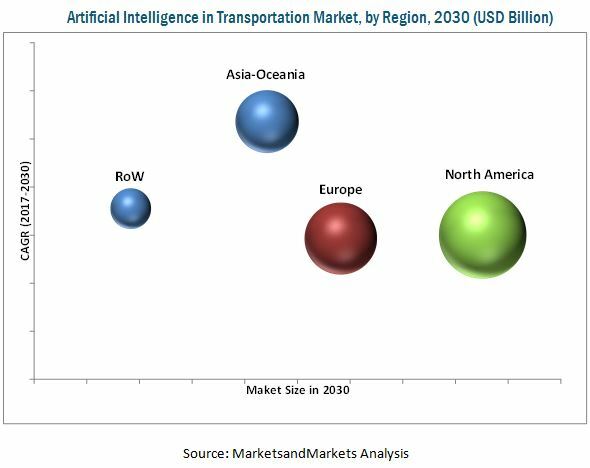 Growing demand for safety & security and increasing focus toward reducing the operating cost of transportation have triggered the growth of the artificial intelligence market for transportation. The research methodology used in the report involves primary and secondary sources and follows a top-down approach for data triangulation. The study involves the study of country-level regulations related to autonomous driving and analysis of different applications considered for artificial intelligence in transportation (autonomous trucks, HMI in trucks, and semi-autonomous trucks). This analysis involves historical trends as well as existing penetrations by country as well as application. The analysis is projected based on various factors such as government regulations, key developments, public acceptance, level of automation in that country, and adoption rate by OEMs. The analysis has been discussed and validated by primary respondents, which include experts from the artificial intelligence in transportation industry, AI professionals & consultants, and software & hardware suppliers. Secondary sources include associations such as Association for the Advancement of Artificial Intelligence (AAAI), European Coordinating Committee for Artificial Intelligence (ECCAI), artificial intelligence software & hardware suppliers’ websites and annual reports, and paid databases and directories such as Factiva and Bloomberg. 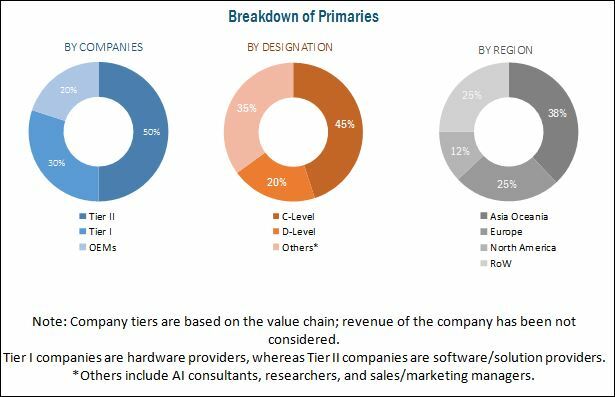 The ecosystem of the artificial intelligence in transportation market consists of Tier I suppliers and software/service providers such as Continental (Germany), Bosch (Germany), NVIDIA (US), and Microsoft (US). These systems and technologies are supplied to automotive OEMs such as Volvo (Sweden), Daimler (Germany), and others. The artificial intelligence in transportation market is projected to grow at a CAGR of 17.87% from 2017 to 2030, and the market size is expected to grow from USD 1.21 Billion in 2017 to USD 10.30 Billion by 2030. The increasing government regulations for vehicle safety, growing adoption of advanced driver assistance systems (ADAS), and development of autonomous vehicles play a significant role in the growth of this market. Deep learning technology is estimated to be the largest and fastest growing segment of the artificial intelligence in transportation market, by machine learning technology. The deep learning technology is widely used in the development of autonomous vehicles, which need to see, think, drive, and learn. The last step is “learn,” where deep learning will be critical for achieving fully autonomous vehicles. Many companies are investing in the development of self-driving trucks, which use the deep learning technology for image processing, speech recognition, and data analysis. Autonomous trucks are projected to be the fastest growing segment of the artificial intelligence in transportation market, by application. Autonomous trucks are the major target for the application of artificial intelligence technology. Up until now, AI technology research was focusing on traffic and navigation system, but now the focus has shifted to make fully autonomous trucks. Many manufacturers such as Volvo (Sweden), Scania (Sweden), and Daimler (Germany) are developing and testing fully autonomous trucks. Truck platooning is projected to be the next emerging segment for the artificial intelligence in transportation market. Artificial intelligence technologies such as sensor fusion, signal recognition, forward collision warning, and lane keep assist are the key drivers for truck platooning. The growing environmental concerns, increasing fuel efficiency, stringent government regulations for emission, and concerns of traffic congestion have accelerated the growth of the truck platooning market. According to the ITS4CV (Intelligent Transport Systems for Commercial Vehicles) study by Ertico, platooning can reduce CO2 emissions by up to 16% from the trailing vehicles and up to 8% from the lead vehicle, as the trucks drive closer together at a constant speed, with less accelerating and braking. The market players such as Volvo, Scania, Daimler, Otto, and MAN are consistently improving their truck platooning systems. North America is estimated to be the largest market for artificial intelligence in transportation, in terms of value. Trucks are the major contributor to the transportation sector of North America. The regulatory developments such as Compliance, Safety, and Accountability (CSA) and Hours of Service Solution (HOS) revisions are expected to drive the growth of the transportation industry in the region. Hence, the artificial intelligence transportation market is expected to see substantial growth. Also, the strong financial position of the region allows these countries to invest heavily in leading technologies in the field of Artificial Intelligence. For instance, according to the Center for Automotive Research, Mexico has received investments of USD 20.00 billion for the automotive sector in the past 4 years. Asia Oceania is estimated to be the fastest growing market for artificial intelligence in transportation, in terms of value. The market growth in the region can be attributed to strong economic growth, booming logistics and supply chain sector, shift of unorganized 3PL (third party logistics) sector to organized sector, and steadily growing population. These factors have played a vital role in the increasing production and sale of commercial vehicles, mainly trucks. The key factors restraining the growth of the artificial intelligence in transportation market are the high cost of artificial intelligence systems and infrastructure development cost. The installation of advanced features such as blind spot detection, lane assist system, adaptive cruise control, and collision warning system increases the overall cost of the vehicle. The artificial intelligence enabled smart transportation needs surroundings which understand it, and this, in turn, is expected to increase the cost of developing the infrastructure. The infrastructure should be able to adapt to the technological advancements taking place in the vehicle and support them for the smooth functioning. Market is dominated by a few global players. Some of the key manufacturers operating in the market are Volvo (Sweden), Daimler (Germany), Scania (Sweden), Bosch (Germany), Intel (US), and NVIDIA (US). *Details on Overview, Services Offered, Strength of Service Portfolio, Business Strategy Excellence, Recent Developments Might Not Be Captured in Case of Unlisted Companies. Table 3 US Department of Transportation's Fatality Analysis Reporting System (Fars).